Squadron Leader Donald Osborne Finlay, Commanding Officer of No. 41 Squadron, in front of his Spitfire Mk. IIA. No. 41 Squadron was stationed at Hornchurch during the Battle of Britain and this is probably where the photo was taken. His Spitfire, “Observer Corps”, EB-Z ser. no P7666 was issued to the unit on 21 November 1940. Before joining the Royal Air Force in 1935, Finlay had a successful career as athlete, competing in the 110 metre hurdles in 1932 Summer Olympics. Already in the service, he joined the British team for the 1936 Olympics in Nazi Germany, winning a silver medal. 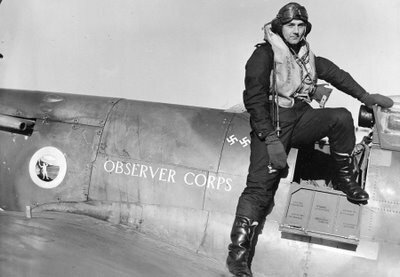 During World War II, Finlay initially flew Spitfires with No. 54 Squadron during the Battle of Britain before being wounded. In September 1940, he took over command of No. 41 Squadron which he led for the remainder of the Battle of Britain and throughout the spring and early summer of 1941. He was promoted to the rank of Wing Commander in August 1941, becoming the Engineering Officer of No. 11 Group . He received the DFC in June 1942. His victory tally, counting two enemy aircraft at the time of the photo, later increased to 4 and 2 shared destroyed, 3 and 1 shared damaged, all on Spitfires.